The beautifully designed Hotel Inn Express Hotel & Suites Concord provides a European atmosphere with 81 spacious, well appointed guest rooms with all the amenities that keep the business traveler in mind. All guest rooms have free high-speed Internet connectivity, coffeemaker, microwave, refrigerator, hairdryer, iron/iron board, 2 line speaker phones, dataports and voicemail. Hotel features indoor pool, fitness center, meeting room and business center. The Holiday Inn Express Hotel & Suites is located off of I-85 at exit 60, Dale Earnhardt Blvd. in Concord/Kannapolis, NC. 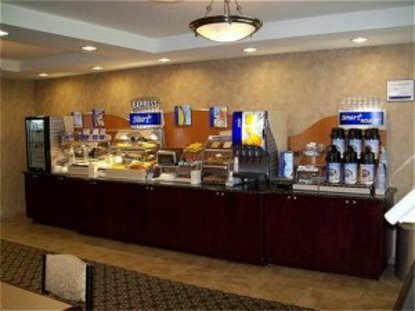 Conveniently situated in the Northlite Shopping center, the hotel is located within walking distance from a variety of popular restaurants including Ruby Tuesday, Logans Roadhouse, and Johnny Carino's. Spend some free time shopping at retail shops including Sam's Club, Wal-Mart, and Kohls (all within walking distance). The hotel is also minutes from CMC NorthEast Medical Center, Windstream Communications, Concord Regional Airport, Perdue Farms, Phillip Morris and Lowes Motor Speedway. This hotel is committed to providing accessible facilities under the American Disabilities Act. If your accessibility needs are not met, please contact the Hotel Manager on Duty. Should you require additional information regarding accessible facilities for guests with disabilities, please call 1-800-Holiday (U.S. and Canada) or contact the hotel directly. For the hearing impaired, TDD service is available at 1-800-238-5544 within the U.S. and Canada.